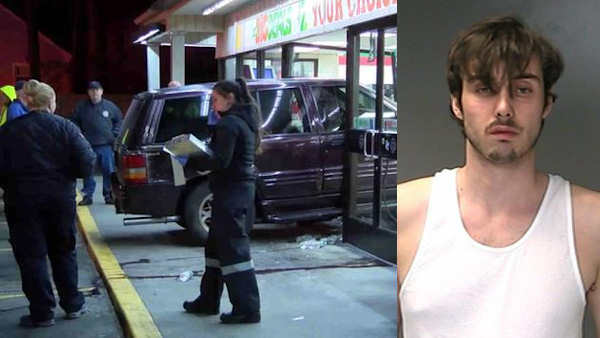 PATCHOGUE, Long Island (WABC) -- A driver allegedly on drugs was arrested after crashing through the front window of a 7-Eleven in Patchogue early Friday. Police say 21-year-old Dylan Iorio, of Ronkonoma, crashed his SUV into the front window of the convenience store just after 1 a.m.
No one in the store was injured, although the clerk was in close proximity to the crash. Iorio was charged with driving with ability impaired by drugs, reckless endangerment and criminal possession of controlled substance. The window was boarded up, and the store is open for business.